Short hairstyle is without doubt the hottest one nowadays as it emphasizes strong and independent nature of modern women and this is the main reason why so many girls and women of all ages keep hair short. Short haircut is the one that accentuates all your best features and of course some little faults. Surely modern hair cutting techniques will help you to hide all those imperfections. 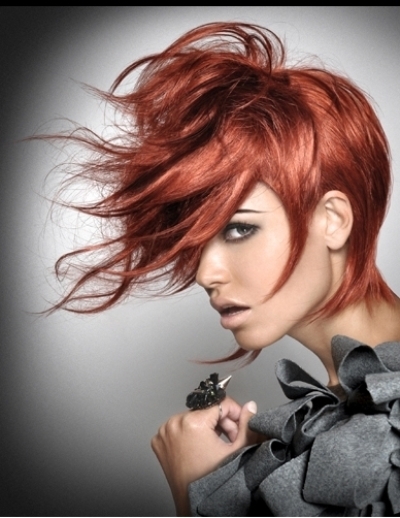 Short haircut will look even more fantastic when completed with proper hair color. The hottest one that is suitable for short haircut is blonde. What else can look more seductive than super short blonde hair. Cool platinum blonde, icy blonde as well as all warm shades will create stunning look but if you are not ready to bleach hair you can add few blonde highlights. Skip the gallery of subtle and natural hair colors and jazz up your look with vibrant and dazzling shade. Going for dramatic makeover has advantages and disadvantages so if you have decided to go for color change let’s find out some pros and cons and then find out what is trendy this season. The greatest advantage of new hair color is changes in image. I am sure that you don’t want to blend in the crowd with simple and dull hairstyle and the easiest way to brighten up your look is to change hair color. Still color change can be a real disaster in case you choose color not suitable for your skin tone. Bright and dazzling color surely looks hot but you should twice as attentive when chosen proper shade. The consultation with pro colorist is must.